Sir Thrift A lot: Remember The 80's? I do. 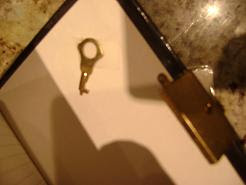 & it still has a key (see below photo). It also seems to be dusty. Note to self: make sure items are dusted before taking photos & if you don't dust them & notice they are dusty when you are posting, don't be lazy & retake the picture. This diary is dated 1987-89 by Stephan J. Cannell Productions. Made in USA. Made by Webway Incorporated. St. Cloud, MN 56302. I just went to Google Webway Incorporated & was hit by a nasty malware site. Very nasty. Let's hope it didn't correct anything. This diary features Johnny Depp from his 21 Jumpstreet days on the cover. It's in new, unused condition & even still has the key taped to the back of the cover. Good find! Had found it on my last trip to Windsor, was supposed to post photos of it AGES ago! Now I have the 21 Jump Street song stuck in my head now, lol. It was a great theme. 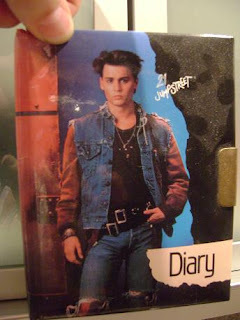 I loved 21 Jump Street. Really takes me back.